Start your white label website quickly with a wide choice of designs, and customise each section to suit your own needs. This way, the final result will be completely unique! Our white label service is suitable for all devices and is accessible to all of your visitors. Create your own brand in multiple steps. We offer tons of layouts, carousels, sign up forms and thousands of styles. This way, you will always have a unique white label. Unleash the maniac inside you and create your own unique brand. You can customise every section on our white label. Mobile, tablet and desktop. We support all devices. 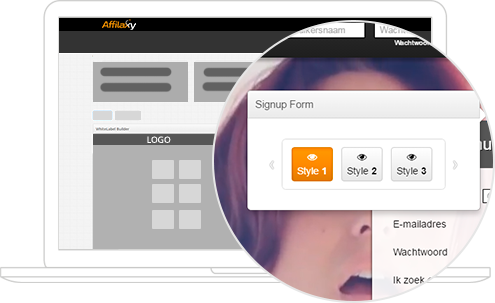 Create an account on Affilaxy and get in touch with our team. Pick a name for your white label and choose a niche. Start with the design for your white label. Don't worry, we will guide you. After you submit your white label, we will get in touch with you to review your white label. After approval, your white label is ready to go! The only thing left is to start promoting it.